Macramé is an extremely ancient knot-tying technique. 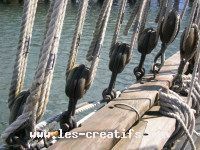 Later on, sailors used knots on hemp ropes: each knot had its own particular purpose in relation to crew safety. Let's learn to tie decorative knots together. Despite the invention of the loom, the art of hand-tying knots has not been lost: sailors still know how to repair their huge nets and also use knots to moor their boats and hoist sails. Even today, little girls adore making these Brazilian bracelets (from thin, colorful cotton threads) and scoubidous (long, thin lengths of flexible plastic) using macramé techniques.